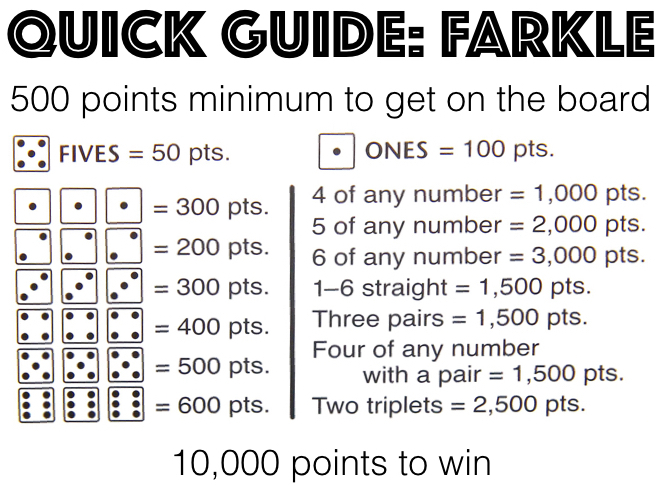 Farkle is a dice game that is easy-to-play and can be enjoyed by 2 or more players. Are you a risk taker or avoider? The most points wins this game! The video tutorial and explanation are below. Objective: The object of the game is to score the most points by rolling different dice combinations with 6 dice. Once a player scores 10,000 or more points, each other player gets one more turn to try and win. Game Play: A turn begins by rolling all 6 dice. If the roll results in any points, the player will keep the dice worth points, and has the option to roll the remaining dice again. If rolling again, the points from previous rolls are at risk. If no points are rolled, known as a Farkle, your turn is over and no points are awarded. After a point roll, a player can take the points and give up his/her turn. If a player rolls points with all 6 dice (in any amount of rolls), the points roll forward, and all 6 dice can be rolled again. Winning: Once a player reaches 10,000 points, the other players get 1 more turn. Once those turns are completed, the player with the highest score wins the game. A player must score a minimum of 500 points in order to get on the scoreboard. After that, a player can stop and score any amount of points. A player cannot add dice to previously set aside dice.